Driver Jenson Button is expected to announce an end to his sixteen-season career in Formula One sometime before this weekend’s race at Suzuka, reports The Telegraph. Button had been in negotiations with McLaren, but will likely bow out instead of spend another season in the uncompetitive car. Rumors on where he will go hint at an Anthony Davidson-like split between the World Endurance Championship and media work, possibly even as a host on the revamped Top Gear. According to The Telegraph, Button has been in talks with Porsche’s LMP1-class WEC team in the past, where former Red Bull driver Mark Webber also ended up after leaving F1. Button has also been linked to rallycross, as his father John was a successful rallycross driver in the seventies. McLaren’s option to renew Button’s contract for 2016 will expire in the next month. 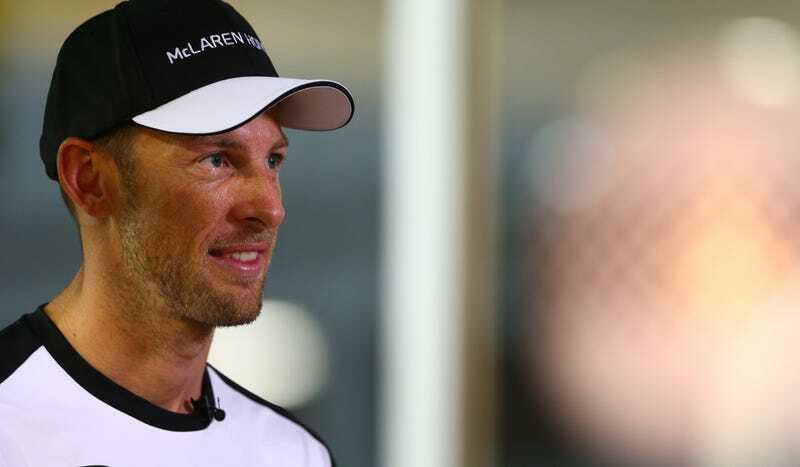 The Telegraph reports that the relationship between Button and team chairman Ron Dennis isn’t as friendly as it used to be, which likely explains some of the candid statements Button has been making to the media lately. Button only narrowly edged out Kevin Magnussen for his drive this year, as Dennis publicly favored Magnussen for the drive. My head knows but my mouth and tongue doesn’t know. The joy of being in the car is only there if you’re fighting at the front, because you feel like you’re achieving something. If you’re fighting near the back, you’re driving an F1 car, but you can easily get joy driving something else. The joy you get is from competing. It’s about fighting at the front. It’s about the possibility of standing on top of the podium. That’s the joy of F1. Meanwhile, Magnussen and fellow McLaren Young Driver Programme protege Stoffel Vandoorne are both more than happy to take Button’s seat. I have made that decision, that’s the important thing. It is always nice to make an announcement when you are at your home grand prix, but I don’t know what’s happening yet. There are a lot of meetings in Japan, Ron Dennis and Eric Boullier will be there. I’m sure there will be a lot of meetings at the headquarters. Whatever’s done is done. If Button leaves, it certainly opens up another seat on the grid during a silly season where many drivers are staying put in hopes of nabbing a seat with Ferrari or one of the more successful teams. McLaren can’t lay claim to success anymore. They’re one of the most historic names in Formula One, but their new Honda power units have been — to put it far too nicely — a work in progress at best. When Button leaves, they’ll likely have to settle for a driver with less experience (such as Magnussen or Vandoorne) or someone who doesn’t bring a prior world driver’s championship to the table. For the team’s sake, let’s hope that either most of the development work is done in terms of getting the Honda power units up to speed for next year, or that current driver and two-time world driver’s champion Fernando Alonso is sticking around for at least another year. As for the timing, why is he announcing this at the Japanese Grand Prix? Button’s wife, Jessica Michibata, is Japanese. The couple has a huge following in Japan and treat it almost like a second home race.